Someone treated rif to lunch at Ole-Ole Bali a few weeks back and he told me the food was quite good. 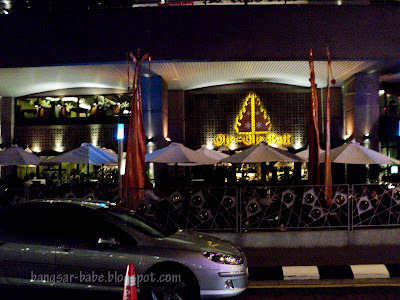 According to him, it was better than Bumbu Bali (same group of restaurants). Since we were running some errands around the area, he took me to try the food there. 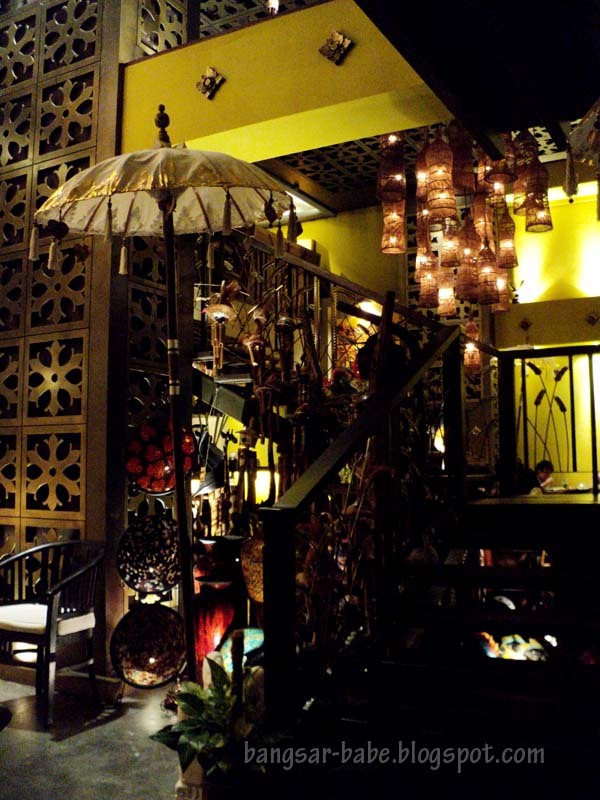 Ole-Ole Bali has a rustic decor with wooden furnishings that gives the restaurant a relaxing, laid back feel. It can get a bit crowded, especially during dinner time, but if you’re willing to dine al-fresco, it wouldn’t be much of a problem. 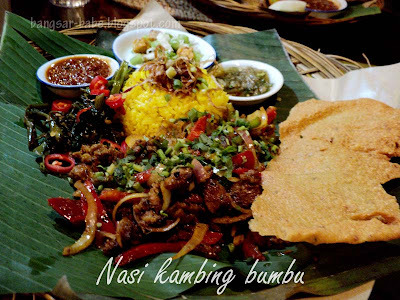 Kambing Bumbu (RM26) comprises yellow rice, vegetables and stir-fried lamb cutlets with a side of condiments (sambal terasi and sambal matah). This was delicious. The lamb was juicy and tender without being overly spicy. I liked that the spices helped reduce any gaminess in the lamb. It was lovely, especially with the sambals. Ole-Ole Trio (RM38) is one of the signature dishes in the restaurant. 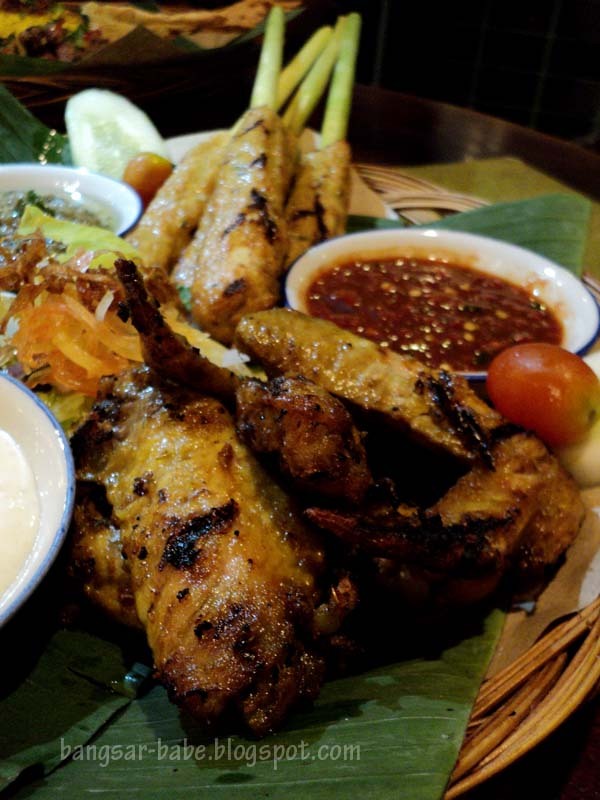 It consists of Ole-Ole BBQ Wings, Sate Lilit and Cumi-Cumi Goreng (fried squid). 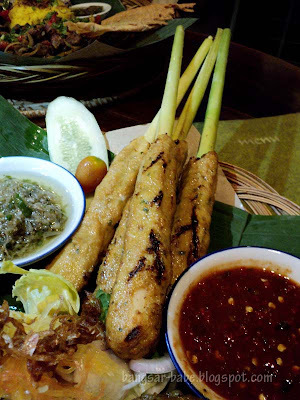 Sate Lilit was well seasoned and got its fragrance from the lemongrass stick. 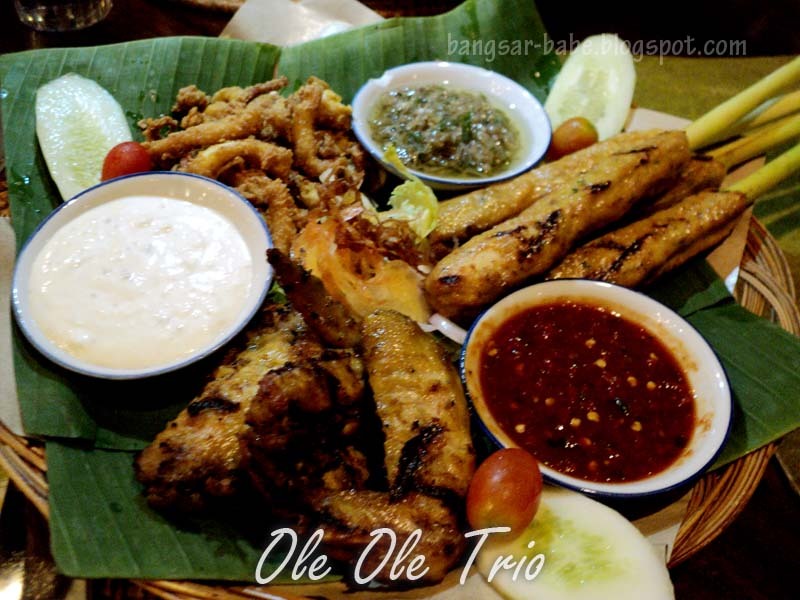 It tasted very good when eaten with the sambal matah. The fried squid was nothing fantastic, but it was still good finger food. I found the batter flavourful, and enjoyed it even more when dipped into some mayonnaise. The chicken wings were nicely grilled, and the meat absorbed the seasoning well. I enjoyed the Barley Lime (RM6). 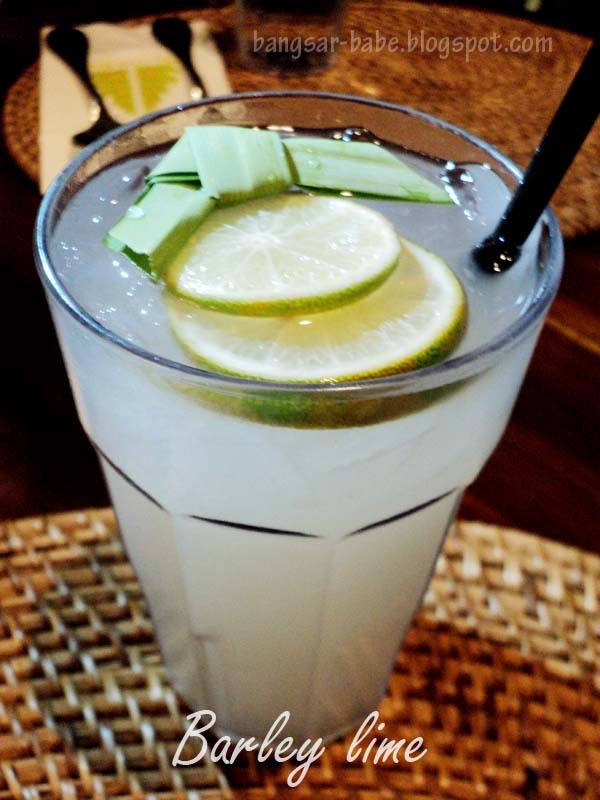 It was thick and fragrant from the pandan leaves, with an extra kick from the lime. Very refreshing, it goes well with spicy and greasy food. You can also order a jug to be shared among 3-4 people for RM18. All in, dinner was quite good — I especially enjoyed the Kambing Bumbu. Definitely something I would order again. 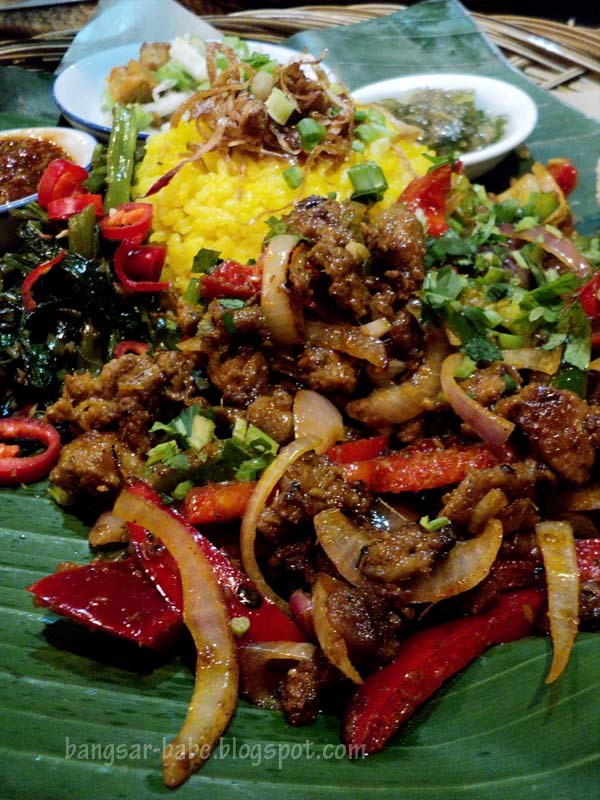 Verdict: Pretty good Balinese food, but prices are slightly steep. Thanks for the post…now I know where to go for great Balinese Food,which I've been hunting for quite long.. Extreme Power – Me too! 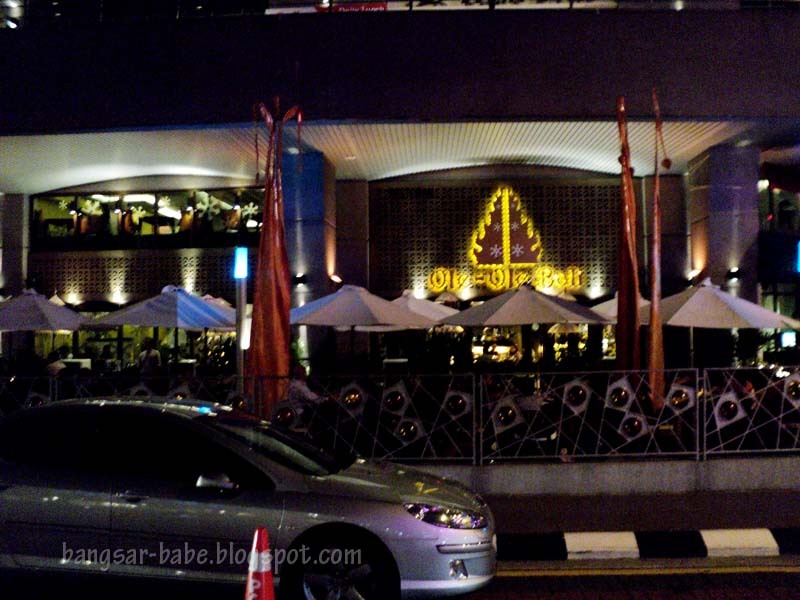 leo – Hmmm…you can go for their Ayam Bumbu set. Or the grilled seafood. I heard that one also not bad. Sumandak From the Land Below the Wind – Thanks for dropping by!